In construction this panel utilised various types of fabric manipulation. 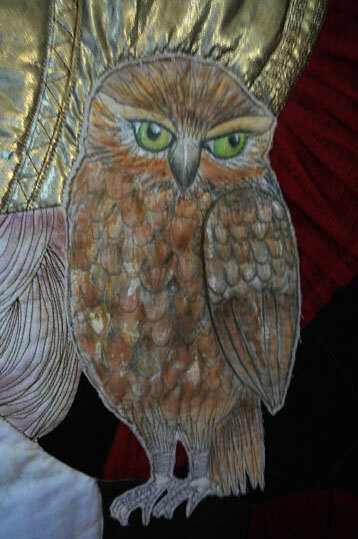 For instance the plumage of her helmet was made from pleated mesh-like fabric and her helmet is made form gold lame that was quilted to give the effect of an engraved and beaten metallwork design. 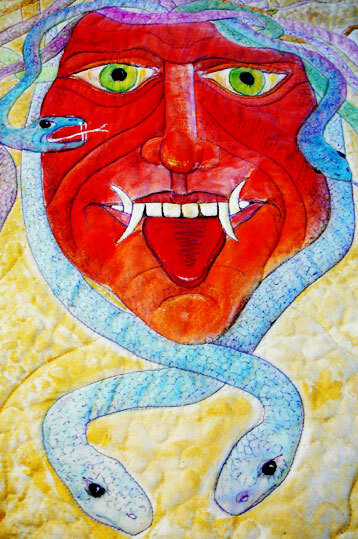 Silk, cotton, metallic threads, applique, quilting and handpainted elements all meld together in this piece. Incorporating different neeedlework techniques seemed appropriate for this Goddess. The great Athena is well known not only as the wise,warrior patron of Athens but also as a superb craftswoman, who was especially skilled in weaving. Athena’s prowess in war, justice, arts and crafts and agriculture makes her a very ancient and powerful deity who was trimmed to fit into patriarchial thinking of Classical Greece, especially by Homer who had her emerging from the forehead of her supposed father,Zeus. Presenting her in this way made Athena not of woman born but rather a man’s creation. According to myth her mother was Metis, the Goddess of creative thought and wisdom,whom Zeus feared. In this way Homer presented her in what appears to me a very contrived and deliberate effort to redfine her and disconnect her from matriarchy and her true essence and power. However, I feel the worship and respect for the ancient Athena was so well entrenched he dared not obliterate her importance. Athena’s symbols speak of her ancient origins, especially the serpent which possibly indicates a Minoan form, making this Goddess predate Zeus. Some link her to the Amazons in Libyia through her warrior role. The symbols of serpent and Medusa that are always presented with her are further indications of her ancient origins and her true power and qualities.And of course those bird symbols,the owl and also the dove which again bespeak of ancient traditions. What is quite revealing is that this Athena presented Herself to me at first through Her Medusa aspect; that very ancient self who was later distorted and misprepresented as the evil gorgon whose stare turned men into stone. 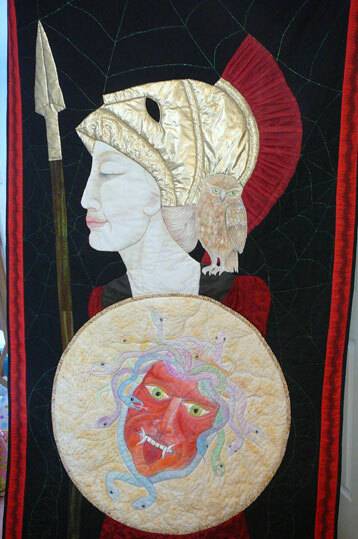 Medusa-Athena is the deep self, the seat of creative and intuitive wisdom. She is the self who has been lost and denied, distorted and maligned. She and Athena are one- the complete woman, the selfempowered, strong and confident woman. The woman who we all aspire to become denying to ourselves that this is who we are and always have been.